Question: How do you troubleshoot ESXi host PSOD problems? 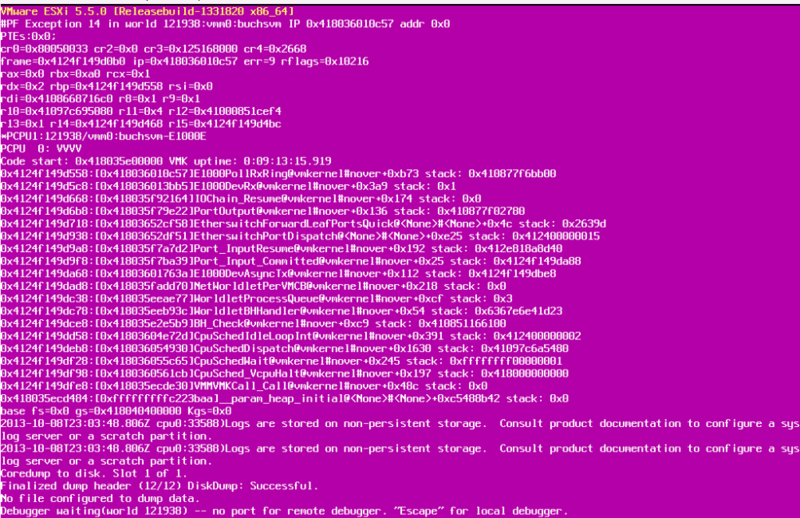 Recently the server has crashed four times, showing the Purple Screen of Death. Once this happens all of the virtual machines on the server stops and crashes until I restart this server. You need to highlight important step to capture log file information after the PSOD occurred. To resolve this issue, extract the log file from a vmkernel-zdump file using a command line utility on the ESX or ESXi host. This utility differs for different versions of ESX or ESXi. Note: The file name created for the log in this example is vmkernel-log.1. If another file with the same name already exists, the new file is created with the number suffix incremented. Most of the times it will be hardware issue and you need to open a case with Hardware vendors, in this case it is HP. Based on findings you need to replace the Hardware devices or upgrade the firmware as suggested by Hardware vendors via ITIL Change Management process. Finally if you want to be expert to analyze the logs on your own, then here is the good KB Article from VMware. It’s rare that Interviewer asking about debugging this issue but he wants to check your understanding about procedure followed in case of PSOD. Happy Learning and All the Best for your Interview. If u can Possible plz update the real time scenarios every week.. These are very helpful to me.